You’re in for a treat, my friends! One of the sweetest and most talented bloggers I know is here in the Idea Studio today to share her awesome DIY tips and tricks for painting furniture with us. And to double your DIY fun, I’ll be sharing my furniture painting tips over on her beautiful blog. Check it out when you have a sec. Please give a warm welcome to my friend, Krista! 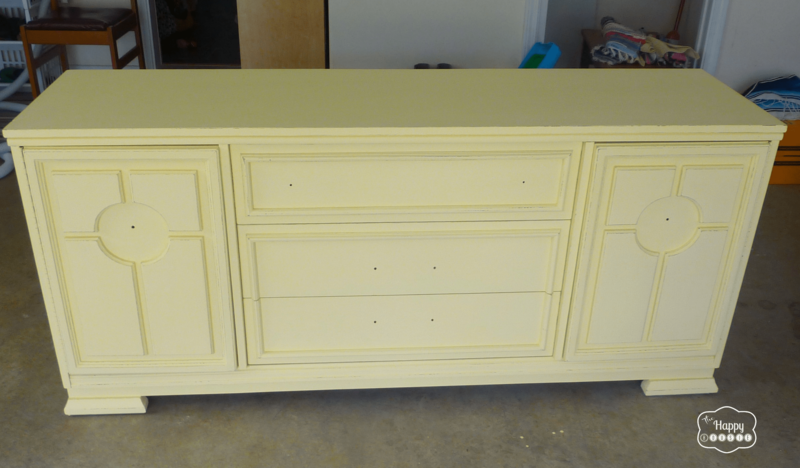 Hello readers of Fresh Idea Studio… I am so excited to be here today to share with you one of my favourite recent paint projects: a dresser turned DIY Chalk Painted TV Cabinet. Thank you so much to Therese for having me over at FIS today. My name is Krista and I spend most of my bloggy time over at The Happy Housie. I called my blog that because I must admit to you that I am a bit of a “housie”… (think foodie but for houses). I love all things related to houses: decorating, DIY, organizing, crafting, gardening, and more. I love sharing projects and ideas, and especially love finding old pieces and fixing them up to make them vibrant and beautiful again. Today’s paint story is one of those pieces. 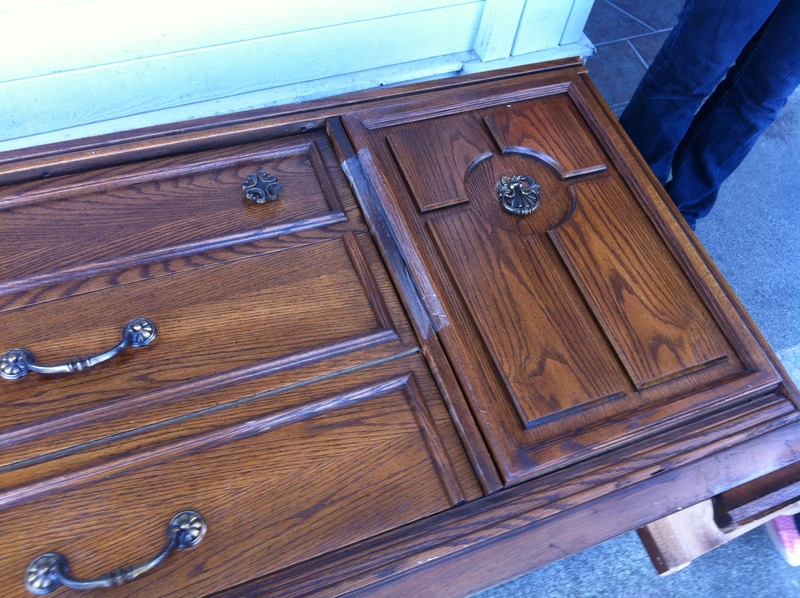 I picked up this well-loved (read: quite used) dresser while on a thrift shopping day trip with some girlfriends. Luckily we had taken my truck that day so I had room to pack it home. I thought it had great lines… the three drawers in the middle would be great storage, and the two doors on each side actually conceal more drawers. First I cleaned it thoroughly and removed all the hardware. Look, someone forgot their socks! Next onto some modifications. My husband is not doing sit-ups in this picture. He is, in fact, switching the side drawers out for shelves. He attached some back bracket pieces and used thin pieces of MDF for shelves to house all of our media equipment behind a closed door. We also made a few minor adjustments to the interior in order to fit media equipment – we cut and rebuilt the bottom middle drawer to create more space for our technological needs. You can see we had a little helper for this… he loves to help on all our projects. Once the modifications were complete, I whipped up some DIY Chalk Paint using the same recipe as I have used for other projects. I chose to use DIY Chalk Paint because I knew that I wanted to distress the piece once painted and the chalk paint allows for easy sanding and distressing. The yellow is quite pale on top of the dark wood so it took four coats of chalk paint. Luckily it dries quickly so I still managed to complete all four coats (and wax it) over one weekend. Next it was time to break out the sand paper and distress my new paint job. Lastly a coat of wax… apply a good amount of wax with a clean, lint-free cloth. Let dry for a few minutes and then buff it off. Lastly I spray painted the old hardware white and reused most of it – the two top middle knobs are new but work well with the repainted hardware because they are white ceramic. 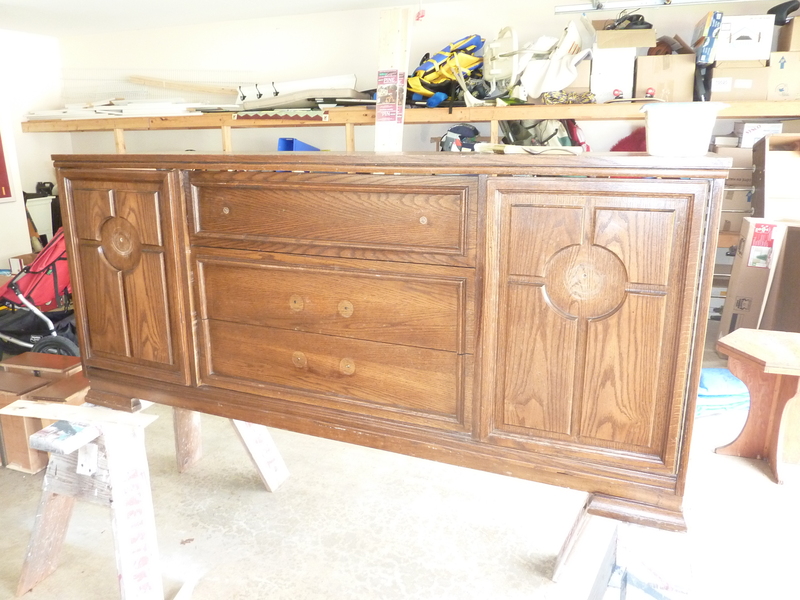 I am thrilled with the bright fresh look that the new TV Console gives our living room… we used to have a tall, red armoire and we find that this lower profile piece has really helped to brighten and open up the room. Thank you so much, Therese, for having me over at your fabulous blog today to share this project! 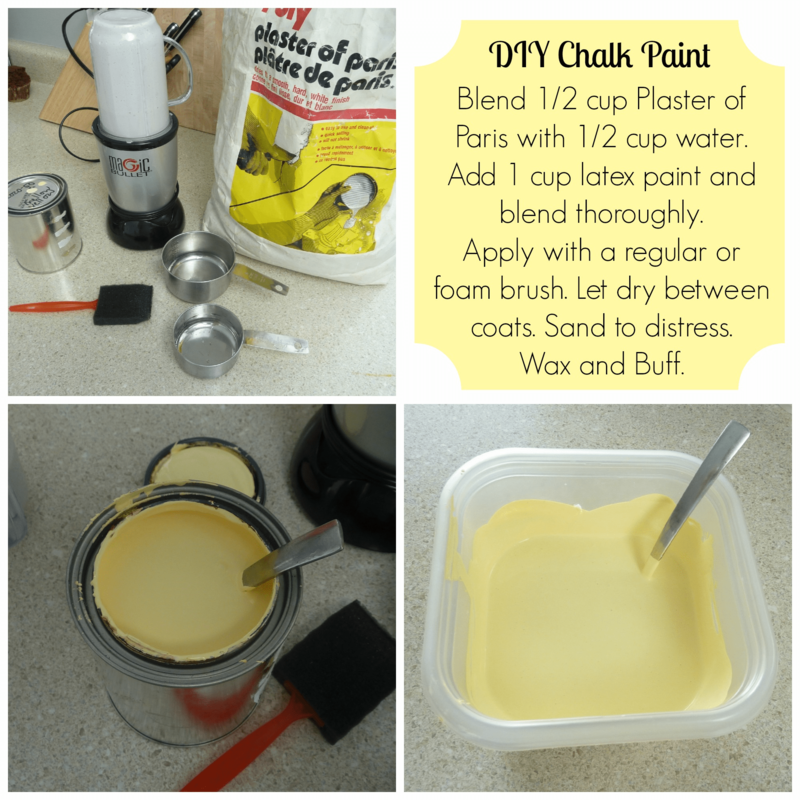 I have a few other DIY Chalk Paint projects to share…. Have you been painting any furniture lately? Any DIY chalk paint? I would love to hear about your experiences and I hope to meet all you lovely FIS readers soon! Hope to have you come for a visit. What a good looking piece and I love the yellow! 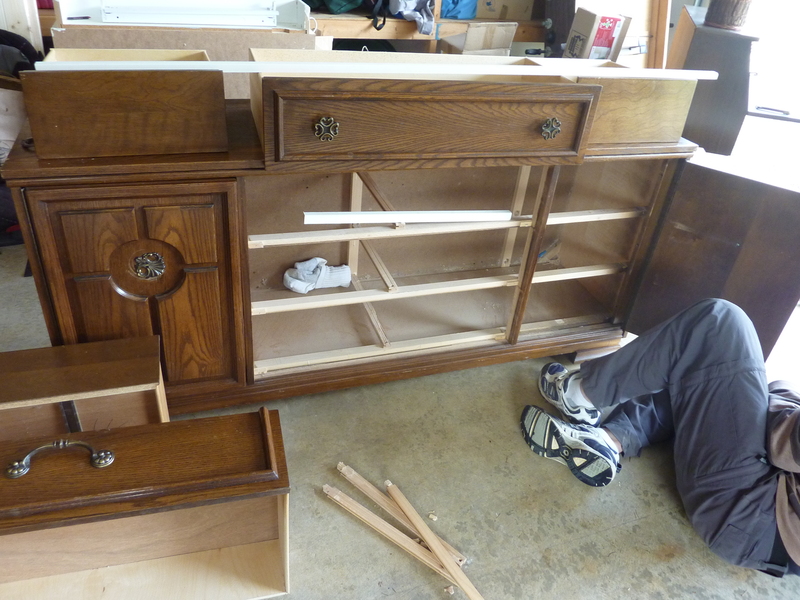 You need to hurry on back here so we can get my big ole armoire done! Hope you are enjoying your vacation!